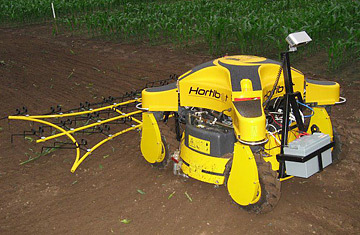 The HortiBot, designed by Rasmus Jorgensen and a team of Danish scientists at Aarhus University's Institute of Agricultural Engineering, spares farmhands the most tedious chore: weeding. As the bot winds through a field of crops  a camera keeps it on track, row by row  it identifies weeds based on the shape and orientation of their leaves. It can be rigged to spray or pull, farmer's choice.